Amazingly, we woke to the sight of snow on Mt. Resaca, our highest point here on Culebra. After a night huddled by the propane stove in our lined coats, dug out from lives past, we weren't terribly surprised. As the sun rises, it is melting but no doubt there will be pictures sent in later. I finally got my computer back after weeks of problems, usually ending with me trying not to sob over the phone line for the return of one of my life connections. Finally I talked to a man in Miami who made things happen and wonderfully, he is Puerto Rican, knows Culebra and hopefully really WILL take me up on the offer for dinner and a drink in thanks if he ever gets here. Bless you Juan! After 5 days of serious heat (and the brief, welcome rain that came with it) and thick haze (that a sailor friend of mine from STT told me was Saharan dust calling early, not volcano ash as I wondered), today was glorious. Clear skies, good breeze, nice temps. A good way to end March. to less than 3 inches. Extremely dry conditions exist for the island. This was taken by a remote camera on Jan. 19th. cold and...well, we all know why we're here instead of there!! 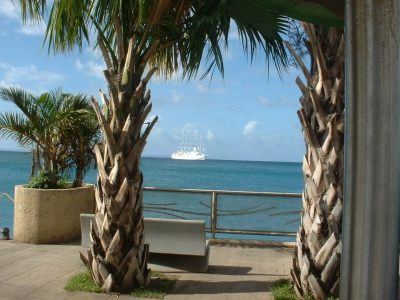 Beach" here on Culebra. Beautiful days to be on the beach lately. blocking the sun and now we are getting wide-spread drizzle. 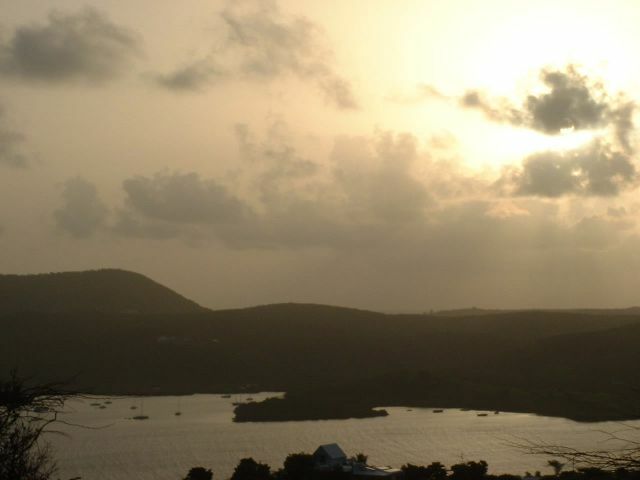 This verifies the haze and grit that started in Culebra yesterday afternoon. recorded 61 rockfall signals, 17 long period earthquakes and 15 long period ? talus in the upper reaches of the Tar River valley. cool! It's blowing like stink and freezing! Oh...that's in about 20 minutes. sunny with lacy clouds for a beautiful day with no rain. and I am glad I have the blanky out for bedtime. Life is good! Waking up early this morning gave the bonus of seeing the Southern Cross on the horizon, perfectly clear, perfectly beautiful. But it is COLD!!! The temp was 68 at 5:30 a.m. here. It has crept up to 70 but my fingertips are still numb. Where did I put those socks? We are loving the cool nights, breezy days and even the showers that only last a few minutes (it is entertainment for the tourists - ok, and friends too - to watch me close the Island Woman cart REALLY FAST! Open Somedays, Closed Others takes on a whole new meaning when I look out over the bridge and see a white out coming up the bay)...but the garden is happy and so am I. Even with crazy Zeta out there...sheesh! 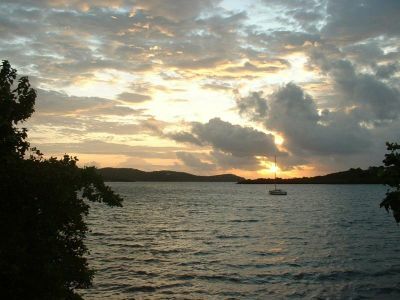 Best wishes from Culebra for all of us to have a new year full of contentment and joy - and for those who were affected so tragically by the past hurricane season, I can only say, time and courage heal, go well into this new year. If we end up having a hurricane party before the Christmas party, someone is going to have to go to STT to re-supply the liquor cabinets here! The weather is fantastic, even with slamming waves (the surfers are ecstatic). When it is cool enough to turn fans off at night, the sound of good sleeping must sooth the critters - even the chickens seem to sleep later. I find it hard to believe Epsilon will make it all the way to our area, but then, I can't believe this season and it just happened. I guess we'll find out. After the heat, after the season, this incredible cool weather in the night and early mornings is a relief in so many ways, and the cat and I are enjoying it immensely! December can stick around just like this for the whole winter! Let the Parandas (tramps, or whatever your island calls them) begin! 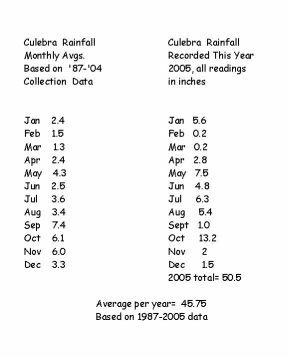 in November, for a total of 49 inches for the year so far. Either the Christmas winds are early (don't we say that every year now?) or my area of the Caribbean is in its own private wind whirlpool. A little rain at night to top off the plants, wind whooshing in cool air, water and leaf music...Welcome! Christmas winds! Sailing plans scuttled, but, better the plans than me! Here at the head of my bay, it is calm and beautiful, at the mouth of the bay it is blowing like stink. My Vieques friend says the surf is pounding hard over there. Last night a couple of boats got blown off the city dock...hopefully that is the most damage we will see off of 27. TROPICAL STORM FORMATION IS NOT EXPECTED THROUGH FRIDAY. 2005. 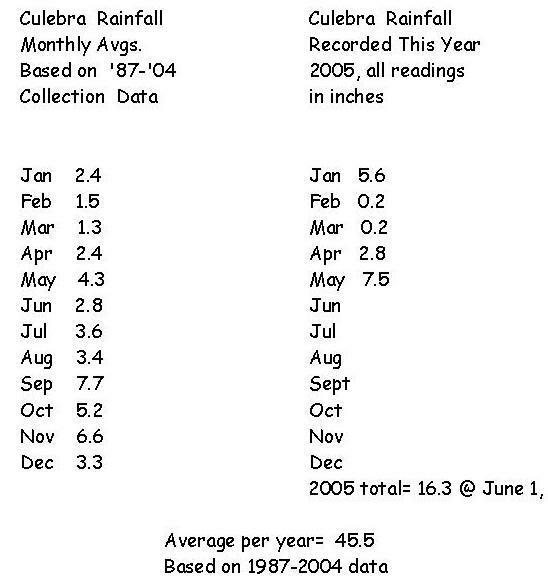 That is our yearly average with two months to go. After a lot of reading to catch up on what has really been going on (which simply isn't told north of us) I am so sad (again) about how much damage happened all around us. 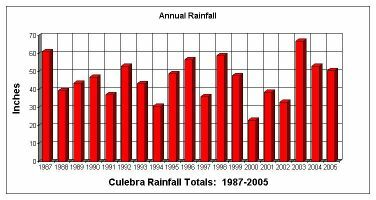 Culebra HAS been incredibly fortunate, even with the long rains we had. Reading the Mexico reports is very depressing, especially as I don't seem to find much news elsewhere, despite so much destruction. May the end of this season come soon. you got to enjoy a fireplace! patchy cloudiness, and we will probably get some more rain showers. thought someone was on our front porch smoking an old stogie! ANY TIME OVER THE WEEKEND. 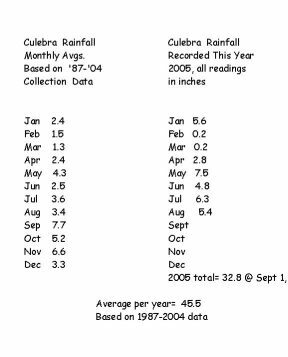 Good Morning,  Culebra's October rainfall for the first 15 days is 10.3 inches. and "fair weather" Cumulus clouds drifting by. Finally, a weak and watery sun. With the rain done for now and muddy water squishing, it was a good afternoon to plant some trees and do some weeding. Even sweat felt good! 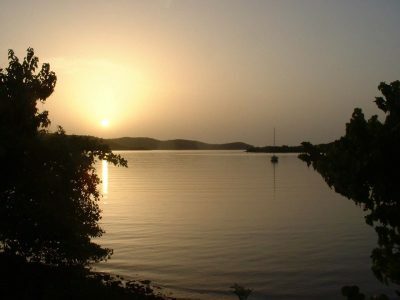 I'll be away from Culebra for two weeks starting tomorrow and leave reporting for our little island in Mr. Bill's very capable hands, with the hope he will have nothing to report at all except how beautiful and green everything looks in the SUNSHINE! - so much for the sun show! INTO THIS AFTERNOON WILL INDUCE FLASH FLOODING. WATERS OR WATERS OF UNKNOWN DEPTH BY FOOT OR BY AUTOMOBILE. Big yellow ball in sky - hurt eyes! What is that thing?? We LIKE it!! While the radar doesn't hold promise, we are, right now, in a calm time, finally! The air is cool, the wind is down, and while the stars are hidden, clouds are only racing across the moon, not completely hiding it. La bella luna!! It is easy to believe that a walk in the yard will not sound with mud slurping on each step, but instead that the plants are going to be 5 inches higher in the sun that is bound to reappear. 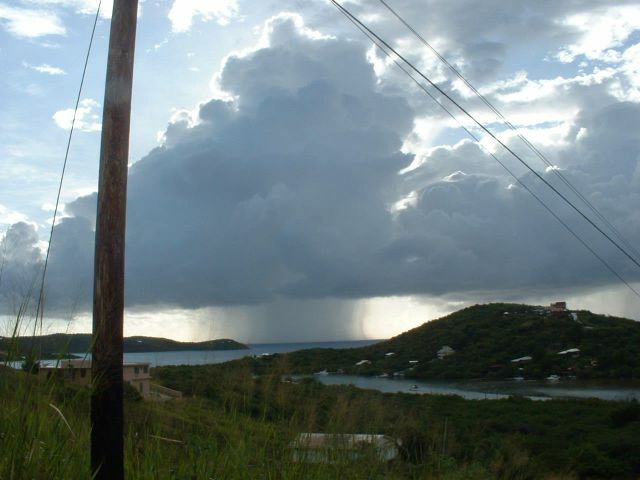 The scientific weather report of the moment from Culebra! - Did I mention rain? It is still raining here, quite dark with thick cloud cover and almost chilly. The water is standing at least 2 inches in my yard. 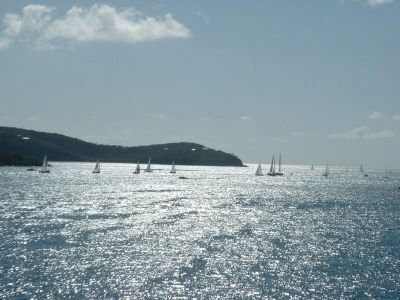 I am going to get out there and see if I can find any of those glass clams they have on Antigua! We are having very light rain and some wind gusts here (but there must have been more rain, in the first light I can see the water is standing in/on my yard). The electric is out, I don't know how long that has been. But the local radar http://www.srh.noaa.gov/radar/latest/DS.p19r0/si.tjua.shtml has all of the VI's and the eastern coast of PR in a flash flood watch until 8 p.m. tonight. I assume that means Culebra and Vieques as well, as we are in the middle of both areas - maybe they can't make teeny tiny boxes? Between 9 and 10 this a.m. the rain came down, along with some big time thunder from lightening I didn't see.! Mr. Bill (who by the way, we are holding responsible - since he mentioned how dry it had been!! ), will have to give the true figures but I'm betting 4 inches or more?...flooding out the roads along with my entire yard. Nothing to do with the system yet to come, but definitely showing how saturated we already are here (the ground, not us...pretty much!) Now it is very still and not raining. Hope the Pinta, Nina and Santa Maria had their hatches closed, I know a few who didn't! THEN SHIFTING NORTH AND NORTHEAST THIS AFTERNOON THROUGH TONIGHT. AND WEDNESDAY...BUT WITH HIGH RAINFALL CHANCES PERSISTING. lightning last night with no thunder; any explanation? Sounded like bb's to me! But after awhile (okay, after about 2 1/2 hours) it put me to sleep again. It was a rather shocking wake up call around 1 a.m. or whatever time it was, and the ground is now saturated and on to overflowing. The rain just stopped here about ten minutes ago, but not for long I think. Who knows though? The sun is out! I like the rain on the tin roof myself, especially when the roof doesn't leak! Finally the rain! Not the three second spits but a nice slow lovely rain that is going on and on - cooling us off and watering cisterns and gardens alike. The radar looks like a circus, and if there is danger near, I'm ignoring it...for tonight. A day of overcast, which was welcomed with a sigh of relief that somehow took all of the heat with it. We got a bit of rain last night; the gardens rejoiced. But to not have the relentless sun boring into us today...along with a decent breeze! Everyone wanted to stay out in it, on porch or bar stool, boat or beach, a day celebrated for its shelter from the blaring sun. 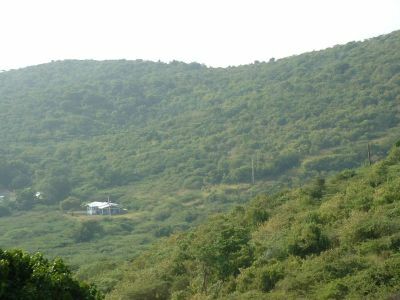 with Monserrats' emmisions settling into a valley on Culebra. To Vieques...yes, I've noticed that too. We were having thunder and lightening (no rain, or very little at that time) and the radar was ...basically blank. Of course, I kind of really LIKED that!! ;) Blank is beautiful! Technology - a beautiful thing, but not always as good as looking at the sky and feeling the weather. I'm sure most of ours ARE up...or on the screen at least. It seems like Mother Nature should have taken a seasonal vow of silence for awhile after Katrina...but she doesn't work that way. Hoping for the best, preparing for the worst...and make sure the liquor lockers are full! Thinking of you all down island and wishing all well and safe in the event 95 comes in. 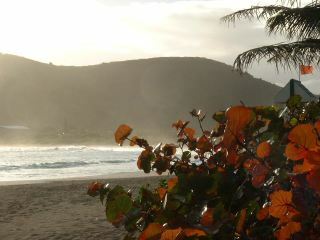 smell from Montserrat, it appears we may have some clearing today. I'm glad I don't live on a hillside. Be careful, you guys! enough to think of cooking soup. Not a bad balance as things this season go. about as long as a bad episode of Green Acres (was there a good episode?). my orchids need to bloom! there must be some universal government thing going on! on our islands and throughout the world. RIP Robin Cook. Thinking of our friends in Bermuda, hoping the wind speed stays low. 6.3 inches. Nothing compared to St. Marteens huge amount in an hour yesterday! But a big shower non-the-less. more now than all day yesterday. heading there soon if it stays dry for awhile. 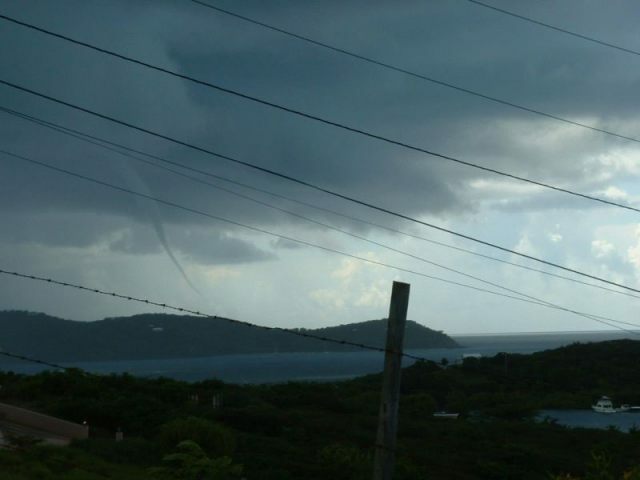 Keep well on Vieques! cool mornings and afternoon/evenings because in between it is hot hot hot! We have some of the nicest tourists on island this week! and food replenished is a good thing! in the PR calendar. Hope they keep the sunscreen on! partying drifting your way, you'll know where it is coming from. now the rain has momentarily stopped and the air is calm, the water glassy. The gardens are very happy. posibility of showers later on. - sounding much better than expected! and thoughts are with them now. While we here get, at times, almost too much information, it appears T & T (and other areas I'm not aware of) get much too little. I cannot imagine no reports from an NHC/NWS/NOAA organizations, or going back to watching weather gauges and the sky for all info. It makes me realize, to my embarrassment, how, while I am very much aware of the weather around me, I absolutely rely on technology during these storm seasons to the point of obsession at times. If there is a way, at a grassroots level, to smooth out the info playing field (which Stormcarib does with its real time wide coverage along with helps to other sources), I'm up for pitching in, though I'm certainly far from a pro. badly by the unpredictable Emily. got/are getting here, and hope all is well. Rain, lightning, thunder and a gust of 42 mph so far at 9:02 pm. way. Hopefully everyone is prepared for the worst while hopin' for the best. - Rainin' on our non-parade! dogsitting for a walk and now is back again. Hope it stops long enough to light some sparklers later on! 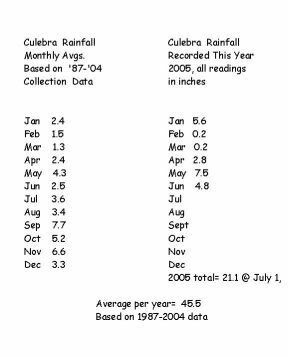 Good Morning, Attached is the updated rainfall data for Culebra. 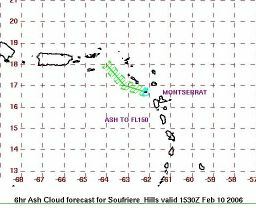 This AM we have haze associated with Montserrat emmisions. - End of June already! have returned, and the garden is happy. Here's to a safe July for all of us! water out of that cloud. A total of .8 inches yesterday. 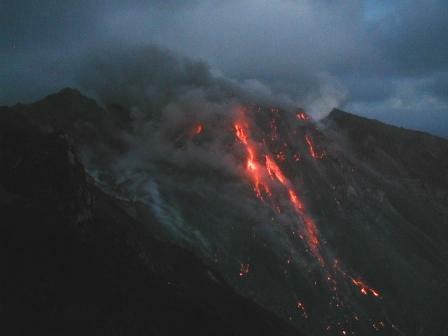 MONTSERRAT AT TIMES THROUGH AT LEAST TONIGHT." the clear/clean trade winds we are used to. 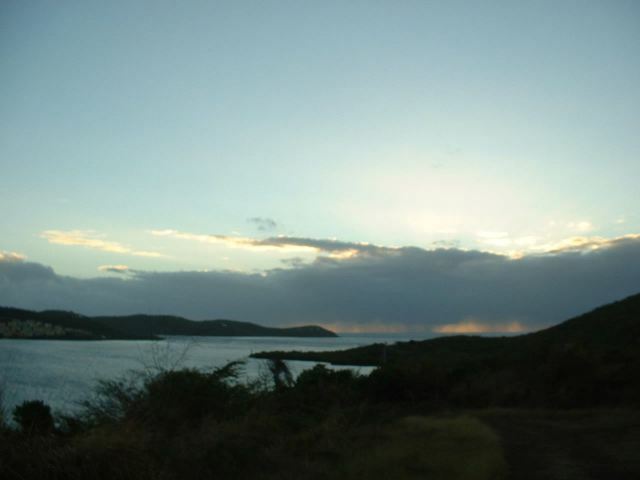 >From hazy, sunny, with barely a breeze Culebra. storm. Great storm, nobody melted!